Restore the shine and protect your boat’s fiberglass and gel coat finish with our vast selection of dual action and rotary boat polishing kits that include Marine 31 boat compounds, fiberglass polishes and marine-specific waxes and sealants. With a dual action or rotary polisher, you can remove oxidation and surface staining with ease. All Marine 31 waxes, cleaners and polishes were developed right here in South Florida which makes them the ideal choice for polishing outdoors where direct sunlight cannot be avoided. Best of all, all Marine 31 boat polishes and fiberglass compounds are exceptionally easy to apply and remove. Each and every boat polisher kit has been carefully assembled to ensure you get professional results – quickly! 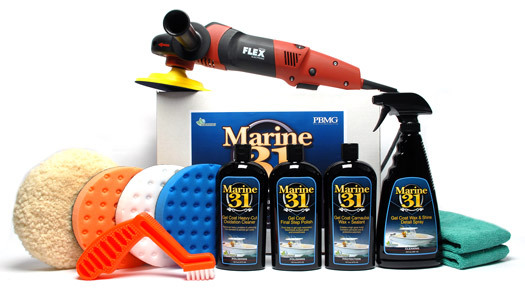 From the best boat polishing pads to the finest boat wax money can buy, we guarantee you will find a boat polisher kit on this page that will suit your needs. If you aren’t sure where to start shopping, we have product specialists standing by that are happy to take your call.